Before the trail of their “in the field” California-style version of Fuego’s Euro 3-D lateral rocker shoe went cold, Woodward and Silverman turned their attention to what else they might have at their disposal to use as a platform (literally) for this concept. The challenge this time: create another version of a lateral rocker shoe that does not incorporate a traditional "shoe" for the base and the nailing surface--but have it be made in one piece instead of three. The case: an aged warmblood with ringbone affecting P1 and P2. Woodward and Silverman had accomplished this in the previous case (see link) by using an aluminum plate screwed to a smaller pony shoe, along with a liberal dollop of sole impression material. 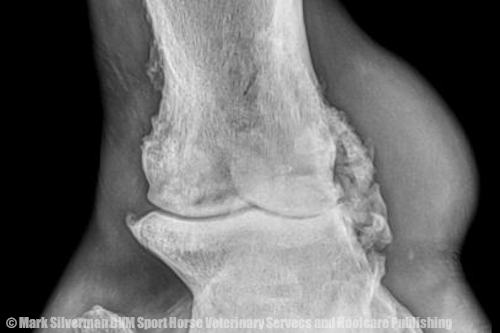 Our case: a pleasure horse with pastern ringbone pathology of P1 and P2, as illustrated in this detail from an oblique-view radiograph. The bony irritation was causing visible soft-tissue swelling (see bulge at right) in the pastern area. A horse like this would be limited to work on a forgiving surface, but even in soft footing would not have much lateral flexibility. 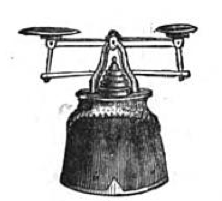 A sympathetic shoeing system might help the horse be happier in its work. What would they engineer this time? The first photo they sent was just a blue rectangle. After a bit of squinting, it became recognizable as a Sigafoos Series II plate. And they were going to nail right through it. No glue. I imagined Rob Sigafoos rolling his eyes. But the wizard of hoof adhesives might take pleasure in the fact that someone was thinking outside the rectangle of his plate. They would transform it from a stabilizing support base used for seriously lame horses into a motion-conducive pivot base for a horse that needed some added mobility. Stability was sacrificed for mobility for this application. high-performance polyurethane around a central plate of aluminum. 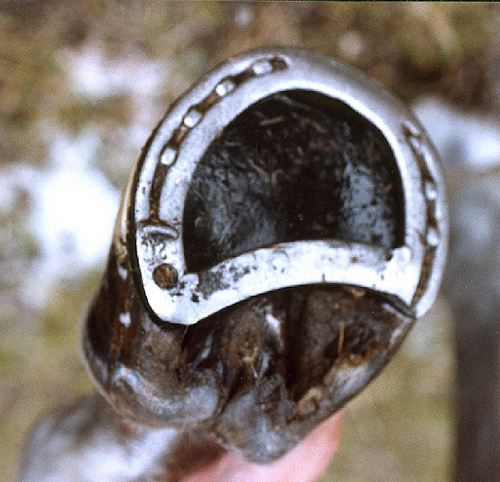 Woodward: “The main reason for setting this objective was to shorten the distance that the shoe adds to the length of the hoof along the outer circumference of the hoof capsule. "Think of it this way: what if we could use a 4 mm (thick) plate and grind it down to 2mm at the edge? We could bevel it to its full thickness inside the nailing surface, as opposed to the standard 8 to 10 mm thickness of a ground-surface breakover shoe with another foot surface shoe/plate then welded or attached to it. The plates are available both flat and wedged. The one that used for this horse was wedged--note gradation of the foot surface (bottom) from left to right (ground surface at top). The aluminum plate is a uniform thickness. “The layer cake effect was good for breakover (on the previous test case) but it added length to the whole foot and migrates the bearing surface of the hoof wall further and further away from the center of rotation of the coffin joint. “The big benefit of the shoe-free concept is that it gives the hoof a motion similar to a round motorcycle tire vs a square car tire. As the motorcycle leans over, a square tire is forced to go up on its edge. This view illustrates the heel of the appliance; it is raised off the ground by the polyurethane ground surface. Note how the wall bearing surface has been rockered to half its thickness. The horse's prolapsed frog will sit comfortably on the pad. Dr Silverman: “It's an important concept to understand that the distal structures of the limb are designed to accommodate terrain irregularities and angular deflections associated with turning. The mid and upper portions of the limb can only handle flexion and extension until you get up to the most proximal joints. ground off the aluminum plate at the wall bearing surface. The polyurethane has been drilled to allow penetration of the dental impression material that will cushion the sole and for weight reduction. Returning to the motorcycle analogy, how much easier on the horse’s joints would a round edge be than an abrupt, square edge? The lateral view clearly illustrates the breakover point and the wedge effect. He continued, "We have a lot of these plates at the clinic as Dr. Silverman is, as far as I know, one of the few people in southern California who has ever applied the very labor-intensive finished product. So he thought it would be a good starting place to build a shoe that offered the kind of movement he wanted for this case. Woodward: "The urethane tread provides not only traction but also a significant dampening effect. Also, the layer used to adhere the cuff to the plate provided a nice separation as a built-in polyurethane pad. This is also nice because it keeps the hoof from direct contact with the aluminum. You can run into corrosion issues between aluminum and the foot." between two polyurethane pads...but it's all one piece. Woodward: "To our knowledge no one has modified this plate for this use. This is not to say no one ever has, just we have never seen or read about it if they did." 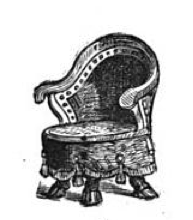 The same design was used for both front feet. “the mechanics needed to be similar or I think that we may have had trouble with overall stability and balance,” Silverman commented. The finished one-piece package nailed onto the foot (left fore). Notice the prominent soft tissue swelling (arrow) from the ringbone. Dr Silverman: “The patient is definitely more comfortable in the shoes, though there was a bit more soft tissue inflammation around the bony changes. We've been going after that with therapeutic ultrasound, coupled with triamcinalone ointment. “Surgery was not an option for this horse. He's 26 years young and the owner didn't feel that it was a good idea to put him through it, though with a joint like this I would have at least consulted a surgeon to discuss surgical fusion of the pastern joint. Lateral view of the left fore after shoeing. The pastern swelling is less obvious from this angle. The same device was applied to both front feet. “Surgery is probably not practical at this horse's age and he actually is getting around ok as a limited trail horse for now. 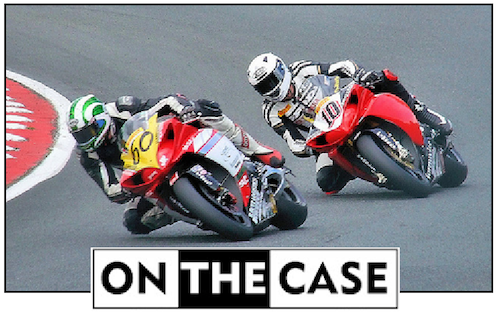 Motorcycle race image courtesy of Flickr user Phil Parsons. Begins 25 April...runs til the back room is empty! Mark your calendar and dust off your keyboard: We're saving you a seat at the first AHF laminitis webinar! The Animal Health Foundation's Dr. Don Walsh will present a one-hour "webinar' (a seminar presented over the web) on Wednesday evening, April 25. The webinar will be hosted by EQUUS Magazine and Equisearch.com (home site of the magazines EQUUS, Practical Horseman, Dressage Today, Trail Rider, etc.) and sponsored by US Rider Equestrian Motor Plan. Here's a chance to see and hear the newest, most important laminitis research explained in context; over 1400 horse owners have already signed up to watch and it will be fascinating to hear their questions for Dr. Walsh at the end of the video and slide presentation/lecture. 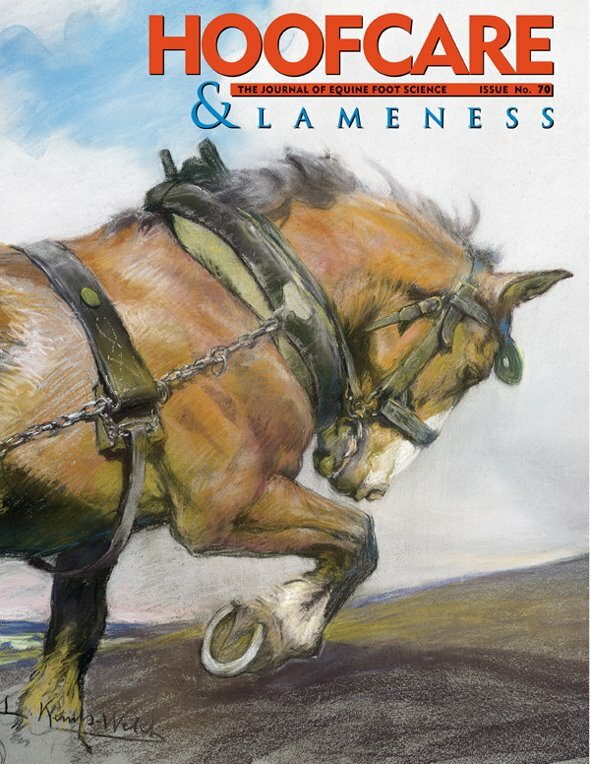 What: "Laminitis Lessons: A Webinar for Every Horse Owner"
Who: Donald Walsh DVM, founder of the Animal Health Foundation, along with an audience of horse owners from all over the world...and you and me! How: Click on the link and sign up--it will take less than a minute. You'll receive a confirmation email with a link back to the same page to attend the webinar Wednesday evening. PLEASE FORWARD THIS (you should see a little envelope at the bottom of this post, which will allow you to email it, or you can use the Facebook or Twitter tools to share it) to horse owner friends, veterinarians, farriers, vet techs and anyone else who would benefit from or be interested in information from the Animal Health Foundation's "Laminitis Lessons". 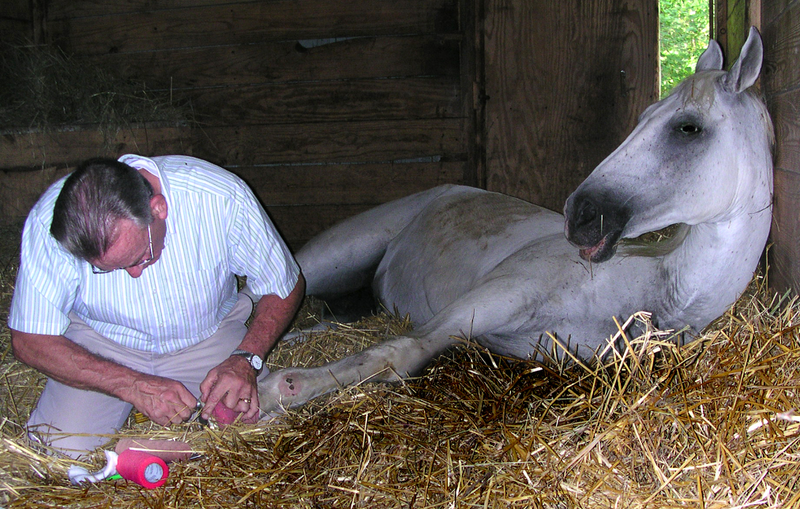 Dr Walsh and his wife Diana founded the grassroots, all-volunteer, non-profit organization known as The Animal Health Foundation in the 1990s to fund laminitis research. Dr. Walsh was a full-time equine practitioner in Pacific, Missouri at that time. 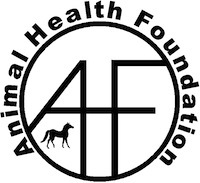 Since they began, AHF has been able to donate more than $1 million to research, primarily through small donations from horse owners who lost a horse to laminitis. Early on, the Animal Health Foundation identified Dr. Chris Pollitt and his Australian Equine Laminitis Research Unit at the University of Queensland as a primary beneficiary of support from the AHF. After his retirement from active practice last year, Dr. Walsh traveled to Australia to conduct research with Dr. Pollitt and his team and has now returned to the USA to share what he learned there and from other AHF-funded projects around the USA. Dr. Walsh recently received the Merial Lifetime Achievement Award at the 6th International Equine Conference on Laminitis and Diseases of the Foot. This year, Dr. Walsh is beginning a national tour of veterinary colleges around the world to educate students about laminitis. He is known for his straightforward, down-to-earth speaking style, has a great skill for explaining complex concepts in a meaningful way, and is a dedicated horseowner himself. Please find and "like" the Animal Health Foundation page on Facebook--and share a story from the page on your own timeline so we can build a bigger Facebook presence! 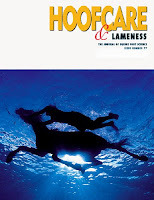 The Animal Health Foundation informational web site and blog: http://www.ahf-lamintiis.org. Farriers really get a feel for their work when they give a foal its first trim. It's a new experience for a young horse. Foals are known to twist and turn and flip and strike and paw with those tiny hooves, which become sharp little hammers at the end of surprisingly powerful little legs. They don't mean to hurt anyone, they're just not sure what's going on. They'll climb up over your back. They'll want to be able to see their mothers. The mare will want to be able to see her foal. You have to get the sightlines right and you have to work fast. Then it's on to the next one, knowing you have a date with the chiropractor already scheduled in your book. And guess what? You're going to need it. But what if the foal you have to trim next is the most photographed, most written about, and most beloved little Thoroughbred in the whole world? What if his mother was the world-class mare who won just as many hearts as she won dollars? That's what happened to Scott Morrison DVM of Rood and Riddle Equine Hospital in Lexington, Kentucky. He spends a lot of time at Lane's End Farm in Versailles, Kentucky, but the other day, he might have taken just a little bit longer to check out the foal who bounces along at the side of 2010 Horse of the Year Zenyatta. How does he look? Zenyatta's pride and joy, who is a son of the hot sire Bernardini, was walked up and down the stall row so Dr Morrison could evaluate his conformation and foot landing patterns. Notice that the barn aisle floor is constructed of non-slip pavers in a herringbone pattern. Not only are they safe for the mares and foals, but they also have an interesting sound effect. There's not as much ring or echo as you'd hear some flooring. Each hoofbeat offers an audible, distinguished tap. Checking foals means using your ears as well as your eyes. Maybe just a touch more off the outside...Baby Z has an interesting little color pattern on his coronet which means that his hooves may be a mixture of black and white horn when he is older. Zenyatta has a similar pattern. I congratulated Scott on being the first to lay a rasp on Baby Z's hooves. He agreed that it was special to work at Lane's End and on this particular foal. Photos for this article are courtesy of Alys Emson at Lane's End Farm; reprinted here with full permission of the photographer, Lane's End Farm and Team Zenyatta. Thanks! In honor of trimming Zenyatta's foal, Dr. Morrison wrote an article about Thoroughbred foal feet and their care for Zenyatta's blog. The last time I checked, the article had 729 comments. 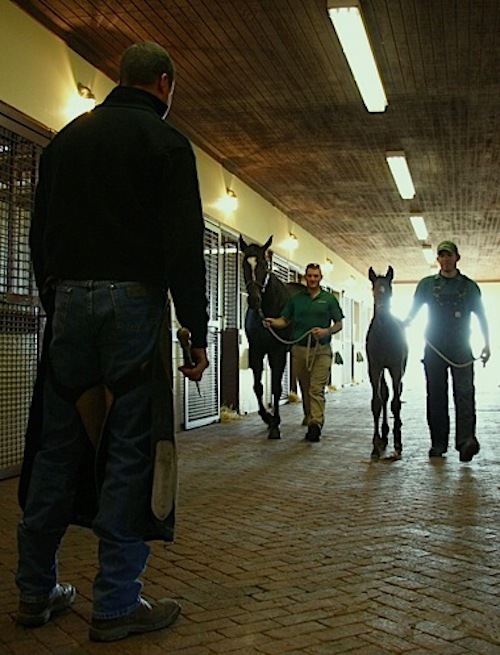 Television wildlife promoter Jack Hanna visited The Ohio State University Veterinary Medical Center's Galbreath Equine Center in Columbus, Ohio in February; he was filming a segment for his television show "Into the Wild." Hanna and crew were hosted by our friend Alicia Bertone, DVM, PhD, DACVS professor of Equine Orthopedic Surgery and The Trueman Chair in Equine Clinical Medicine and Surgery at Ohio State. Dr. Bertone tried to explain different diagnostic methods for osteoarthritis in horses as well as how a horse progresses through her new clinical trial for horses with osteoarthritis--when Jack wasn't mugging for the camera. It's nothing short of fun to watch Jack stumble through the familiar treadmills and force plates and surgery room hoists, all the while taking Dr Bertone not very seriously. Luckily, we know she has a great sense of humor and was well-chosen to host someone like Jack. If you live in the United States and watch television, you know Jack Hanna. But since so many Hoof Blog readers are not US residents, it might be helpful to explain who this character is. Some might say that he is best known for taking his role as director of the down-at-the-heels and unknown Columbus Zoo back in the 1980s and turning "Jack Hanna"--and that zoo--into household names through his back-to-back appearances on every news and talk show on television. He actually does have a show of his own, however. But most of us see him over breakfast on "Good Morning America" or late at night on David Letterman's show. He brings the creepiest or cutest animals he can find and turns them loose on Dave's desk. Jack Hanna still lives in Ohio; that location meant that he became the de facto spokesman to the press during the terrible tragedy of a home zoo gone mad when wild animals escaped from a Zanesville, Ohio farm. One reason he's so effective on-camera is because he plays dumb. Sure, it's dumb like a fox, but it works to get--and keep--the audience on his side. He's been able to become the most visible icon of American wildlife not in spite of but perhaps because of his lack of a DVM or a PhD. With the possible exception of the Zanesville aftermath, Jack Hanna doesn't usually lecture or talk down to his audiences. He falls over his own words often, makes more than his share of off-the-wall comments, and acts downright goofy sometimes, especially when David Letterman is around. The AVMA and AAZPA may or may not approve of what Jack Hanna says or does, but they can't argue that he fuels the public's interest in wild animals, and has probably done more than any individual to increase the sales of family tickets to zoos and nature parks around the country. The horse world could use someone to do for us what Jack has done for zoos. Maybe this little video is a start. The FEI has announced the introduction of an ID card and online exam for veterinarians working at FEI events. The exam focuses on the FEI Veterinary and Equine Anti-Doping and Controlled Medication Regulations. The new system, which comes into effect on 1 June 2012, requires Competitors’ Private Veterinarians, Team Veterinarians and Treating Veterinarians appointed by Organizing Committees to pass the online exam based on the relevant FEI regulations affecting vets who support horses competing at FEI events. Veterinarians wishing to work at FEI events must apply for access to the exam through their National Federations and fulfill the FEI eligibility requirements. Successful candidates should then download their “FEI Permitted Treating Veterinarian” ID card and obtain accreditation from Organizing Committees for stable and treatment areas. Existing FEI Official Veterinarians (including Veterinary Delegates, Testing Veterinarians and Head Treatment Vets) are currently exempt from the examination requirement, providing they download their “FEI Official Veterinarian” ID cards before 31 December 2012. 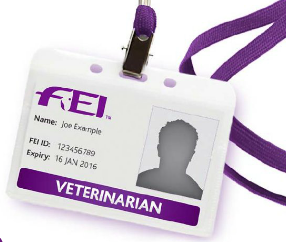 The FEI Official Veterinarian ID card will allow these veterinarians to work either as FEI Official Veterinarians or as Permitted Treating Veterinarians at an event. The ID cards must be produced if requested by Stewards and other FEI Officials. The cards have an advanced “QR” (quick-response) bar code, which allows easy public access to professional profiles on the FEI’s dedicated new database. The exam and ID card are free of charge and relevant documents are available online for reference to encourage understanding of the key FEI Veterinary Regulations, Equine Anti-Doping and Controlled Medication Regulations and General Regulations. “The introduction of this exam and ID card for veterinarians working at FEI events has been well received during the initial testing phase and is designed to strengthen our very clear approach to anti-doping and biosecurity at FEI Events. “The new exam will ensure a consistent level of understanding and interpretation of our current regulations, wider knowledge of Clean Sport and help us to maintain the longstanding FEI Welfare Code. “The simple process has been designed with busy practicing vets in mind, for instance candidates can save their progress and complete the exam later should they be interrupted. Got credentials? This is a media credential confirmation package for the 2008 Olympics. Editor's Note: There are two types of veterinarians working at FEI events: Permitted Treating Veterinarians and FEI Official Veterinarians. The FEI Veterinary and Equine Anti-Doping and Controlled Medication Regulations, along with various other resources are available at the FEI Clean Sport website; additionally the General Regulations are available here. Olympic credentials photo for media by PJMorse. FEI veterinary ID art via FEI Focus. Thanks! It was a big newsday when the world learned that the ship hailed as "unsinkable"
had indeed sunk in the North Atlantic, after hitting an iceberg on April 16, 1912. 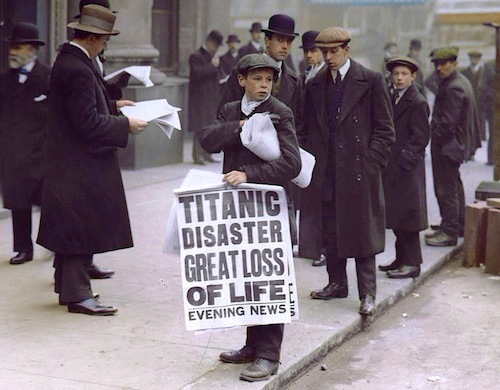 We're hearing so much this weekend about the sinking of the Titanic, as the world marks the 100th anniversary of the terrible tragedy: the unsinkable cruise ship hit an iceberg and--since it was unprepared for the possibility of sinking--1500 lives were lost. At least one farrier went down with that very big ship. 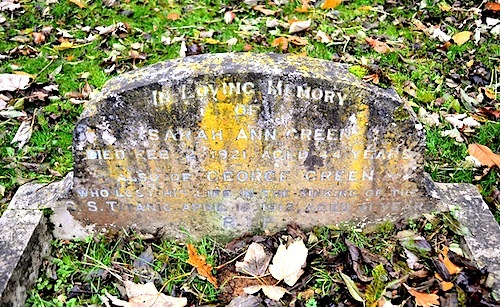 George Henry Green was a 40-year-old farrier who had been shoeing in the town of Dorking in Surrey, England. He was emigrating to South Dakota and was a third-class passenger on the Titanic. Not long before the ship hit the iceberg, he had sent a post card home, saying that he was enjoying "lovely sailing". As a third-class passenger, George may well have been locked below deck when the ship's crew received orders to seal the lower-paying passengers' fate. You hear so much about the Strausses and the Astors and other first-class passengers yet we know so little about those poor people belowdecks who met one of the worst fates imaginable. They didn't have a chance of escape and possibly never even knew what hit the ship or what was going on above them. Out of 599 third-class passengers, only 172 survived. And George wasn't among them. Here's a horse-related trivia fact about the Titanic; The first lifeboat to be lowered was manned by Titanic crew member James Robert McGough, the son of an Irish horseshoer who had emigrated to Philadelphia. And did you know that it took 20 draft horses to pull one of Titanic's 15-ton anchors through Belfast to the shipyard on a wagon? Were there horses aboard the Titanic? It depends whom you ask. Some sources say there were polo ponies aboard, and there's an unverified story about a German racehorse who had a private paddock on C deck. Other people to think about include Charles Robert Bainbrigge, a 23-year-old horse trainer from the island of Guernsey who was traveling to Savage's International Stock Farm in Minnesota for work to be near his sister who had already moved to Minnesota. There are also two passengers who listed their professionals as grooms. Sometimes tragedies just sound like a lot of numbers, but there are people in those numbers. People like you and me. Call 978 281 3222 to reserve your copy or order online at this link. Every once in a while, you'll see one in an antique store or on eBay: a preserved hoof from long ago. A favorite hunter or cavalry charger lives on because one of his hooves was preserved as a trophy. The National Army Museum in London, England has their collection on display now as part of their "War Horse: Fact & Fiction" exhibition. The two primary ones used in curator Pip Dodd's video lecture are excellent contrasts in hoof form and shoe fit. Would you care for a cordial? Rowland Ward combined his big game expertise and his hoof trophy specialty in this mini-bar created from an African elephant's foot. Now, here's my question: Did they only preserve one hoof? Would they have just tossed out the others? What if it was a really famous horse? More recently, I've come to question the preparation of the hooves themselves. If British army regulations required hooves to be burned with identification numerals, and if the farriers were required to retrieve the numbered hooves after battle, why do we seldom see hooves with numbers burned into the wall? Were they sanded down until the numbers disappeared? 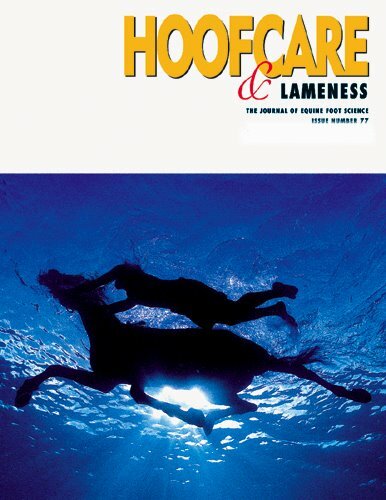 Were some preserved hooves merely vehicles to display horseshoes? This heart bar shoe is almost 100 years old; it lives in the beautiful tack room at the Badminton House stables in England. The hoof doesn't look particularly like it suffered badly from laminitis, although the beloved horse who wore the shoe apparently did. There may have been different priorities for hoof trophies. "The Household Cavalry still burns numbers into three out of four of each horse's hooves. The near hind bears the horse's army number, the near fore his squadron number and the off fore has the regiment's initials." While some people are repulsed at the site of hoof trophies, others are intrigued. First of all, they were preserved in an era where a rider may not have had the option of a photo or even a drawing to remember a favorite horse. 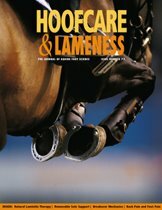 But what intrigues Hoofcare + Lameness readers is that the final product of a trophy doesn't seem to have much--if anything--to do with how the horse was shod. The shoes attached to the trophies seem to have been crafted by silversmiths, not farriers. Their fit is questionable and some even lack nails, although the clinches can still be seen in the hoof wall. 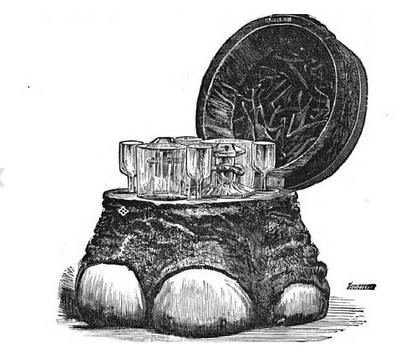 Much more information on hoof preservation--not just of horse hooves but safari trophies and game--was detailed in the 1883 book, Observations on the Preservation of Hoofs and Designing of Hoof Trophies, by Rowland Ward of London and Nairobi. Ward, who had aspired to become a sculptor in his youth, was quite a prolific trophy artist; he offered more than 50 designs for hooves in his shop. His designs were patented and his clients included the Duke of Edinburgh. He was a man of near and far ambitions; while his bread-and-butter might have been British horse hooves, his fame and fortune came from big game bagged by his wealthy clients--many of them Americans--on safari in Kenya. 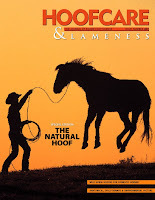 The book details an important part of hoof trophy-making that has always challenged me. 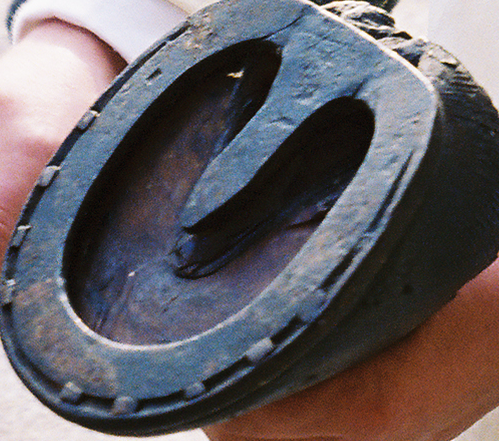 He states that the shoe worn by the horse is useless when making a trophy because the foot will change shape during the preservation process, and that crafting a suitable shoe for the trophy is part of the trophy-builder's task--and that a farrier is not the craftsman to be hired to build the shoe. "The farrier's work should stop when the horse dies," he writes, "by which I mean that when the hoof is severed at the fetlock joint, for treatment by the naturalist, the farrier should not be allowed to take off the shoe, or in any other way to exercise his craft, either by cleaning of the flesh or skin or hoof, in any way whatever, and particularly not by boiling, or scalding or baking...."
He also mentions that part of the skill of the trophy-builder was in repairing the frogs of horses that had been affected by thrush, which apparently was prevalent in the hooves sent to him for preservation. Unfortunately, he doesn't go into much detail about how he did this. Ward employed an assistant who worked on nothing but horse hoof trophies for more than 20 years. Rowland Ward died in 1912 but the Rowland Ward business is still in business in Johannesburg, South Africa. For some time, there was a US branch of the business, most recently headquartered in Dallas. The US office closed in 2009. The company's web site is a mecca for what is left of the big-game hunters, and those who study the history of hunting and taxidermy, and the skillful arts of Rowland Ward. 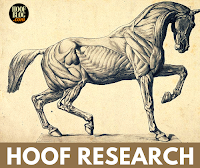 Today we have plastination and freeze-drying to preserve horse hooves, but the reason behind the preservation tends to be for educational purposes, rather than to preserve a memory or create a memorial. We demand lifelike detail, rather than artistic expression. For Rowland Ward, a hoof from a dead horse was a blank canvas for artistic expression and his imagination ran as wild as the big game that arrived on his doorstep to be preserved, hooves and all. One of top contenders in tomorrow's Toyota Bluegrass Stakes at Kentucky's Keeneland Racecourse is aptly named. "Ever So Lucky" should count his blessings that his connections knew the number of a horseshoer who could lend a hand--and a shoe--after the colt grabbed the outside heel of his right front foot. Except he didn't just grab it. He ripped a chunk of it off. Kentucky horseshoer Steve Norman wasn't talking about what he ordered for lunch at the track kitchen. He was talking about what he saw when he picked up Ever So Lucky's right front foot a few weeks ago. He was brought in by the veterinarian to see what could be done to keep the horse in training for his Pennsylvania-based Hall of Fame trainer, Jonathan Sheppard. 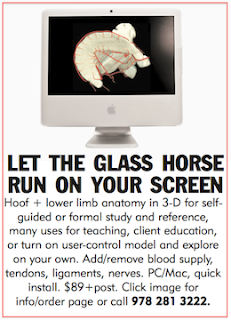 "He ripped the meat of his heel bulb right off," Steve said, echoing what I had read in the Barn Notes for Keeneland. "But that happens a lot. It probably happened in the starting gate, that's where it usually does. A horse scrambles and that hind foot just reached up there." Steve Norman is busy this time of year. In the past, he shod Kentucky Derby winners like Alysheba, Go for Gin, War Emblem and possibly others. In 2009, he shod five runners in the Derby--he must have been in demand for tips that year. Steve Norman's solution for Ever So Lucky was to build a z bar shoe by welding a frog support and a heel bypass into a racing plate. 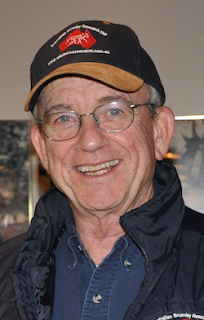 It's not a new answer for the Nebraska native and former jockey--he used a similar shoe on Unbridled's Song, now one of the country's top sires, when he needed to train for the Derby in 1996. That colt injured his heel bulb in the Wood Memorial while prepping for the Derby. 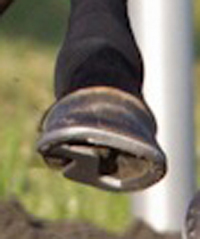 The z bar is often seen on horses with a quarter crack on heel bulb injury. It transfers some of the load to the frog. "You might even call it a half a heart bar," Steve mentioned. "I just shaped the shoe and welded in the bar. The insert z's over in front of the injury." Steve Norman is ambivalent about changing the horse back over. "He could run in that shoe, without a problem," he said Friday afternoon from a stop at Ashford Stud. "Especially on that Polytrack at Keeneland. If he was at Churchill, yes, I'd never hesitate. An aluminum bar shoe with a frog like that is going to slide in the dirt but on Polytrack...it's so much stickier. "We don't have the slip at Keeneland that you see on dirt. But it's fine to switch him, too," Steve said before starting his next horse. Z bar shoes are either a great solution or...not, according to many horseshoers. They are often used for horses with quarter cracks, and are always good for a debate. While they may raise an eyebrow when a Thoroughbred races in one, the Z-bar shoe for Standardbreds is much more ubiquitous, ever since the 1980s superstar Nihilator seemed to win every big stakes race--and do it in record time--wearing a Z-bar for his quarter cracks. Also called a "half mushroom" in some harness circles, the shoe has been the subject of a lot of debate over the years: should the bar be level or set down? Should the bar cross the frog or follow its edge? Joey Carroll was Nihilator's farrier and he always stressed the importance of proper shoe design and application for an injured foot. "You're only as good as the last shoe you nailed on," is a line I have often heard from Steve Norman. Shoeing a horse to heal an injury while simultaneously keeping the horse comfortable and making it possible for the horse to get out and work in the morning is a Triple Crown feat of its own. Ever So Lucky didn't train like a layup. He clocked five furlongs in :57 under Leparoux this week. The Toyota Bluegrass Stakes is one of the final prep races for the 2012 Kentucky Derby. The favorite is the ghostlike gray Breeders Cup winner, Hansen. There's no shortage of interesting horses headed to the gate with him; the purse is $750,000 and possibly the bonus of a trip to Louisville on the first Saturday in May for the winner. 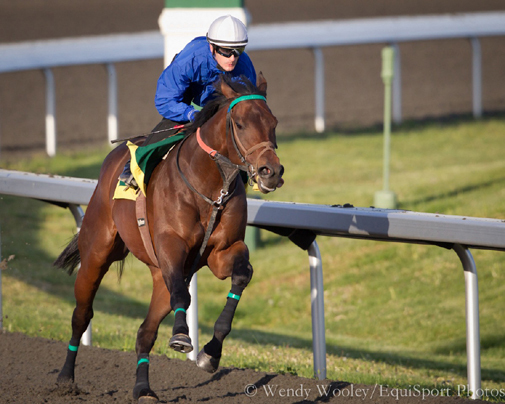 Read about Steve Norman's hoof work on Kentucky Derby winner War Emblem for Bob Baffert. 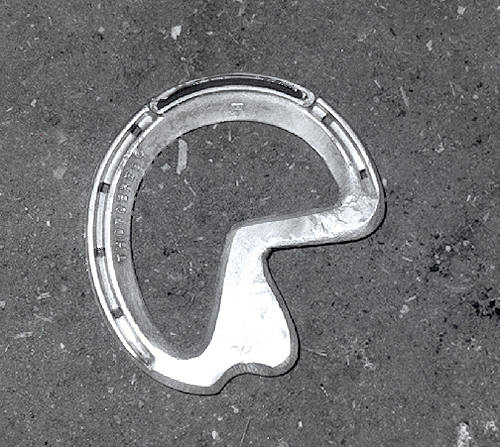 Read "Hoof Care and Shoeing: Barring difficulty" with horseshoers Mark Dewey and Sonny Broaddus commenting, along with Kentucky trainer John Ward, on z-bar shoes. 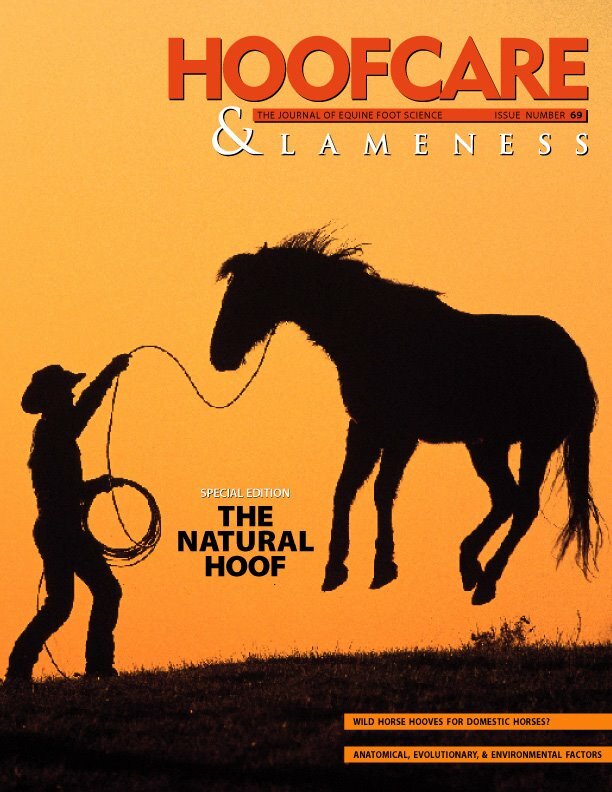 For more on Nihilator and his Z-bar, dust off the photo and story in Hoofcare & Lameness 10, December 1985. Thanks to Wendy and Matt Wooley of Equisport Photos for noticing Ever So Lucky's special shoe on Tuesday--and for thinking of the Hoof Blog. Wendy and Matt write the "Turf and Dirt" blog and will keep you connected with the Kentucky Thoroughbred scene in a brilliantly visual way. Their current top story is a photo collection of Rachel Alexandra at home in her paddock at Stonestreet Farm.